Shop Bishnupuri Baluchari Saree Online at reasonable rate. 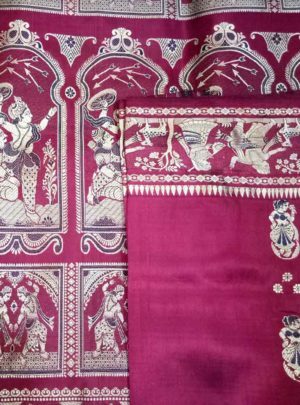 The traditional and gorgeous Baluchari Silk sarees represent one of the finest instances of the weaving skills and eye for details and designs of the weavers hailing from the eastern India, specifically West Bengal. The base color of the featured sraee is black and the weaving is done with Orange Resham threads that depicts mythological figure motifs.